The letters refer to the bus type/ design, since 1990s privatisation, the number of types has really expanded. Letters for classic bus types include ‘RM’ for Routemasters, ‘RT’ for Regent Three, and ‘RF’ for Regal Four. 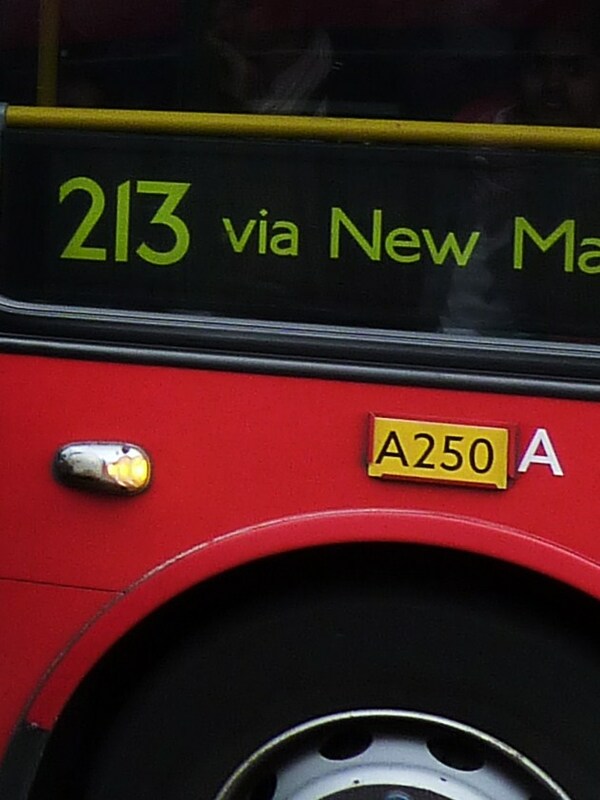 The 213 uses DOEs (Alexander Dennis Trident II Optare Enviro 400) and PVLs (London Plaxton President bodied Volvos). The number afterwards is individual to the bus, like the numbers assigned to limited edition artist’s prints. DOE28 at Sutton Garage. 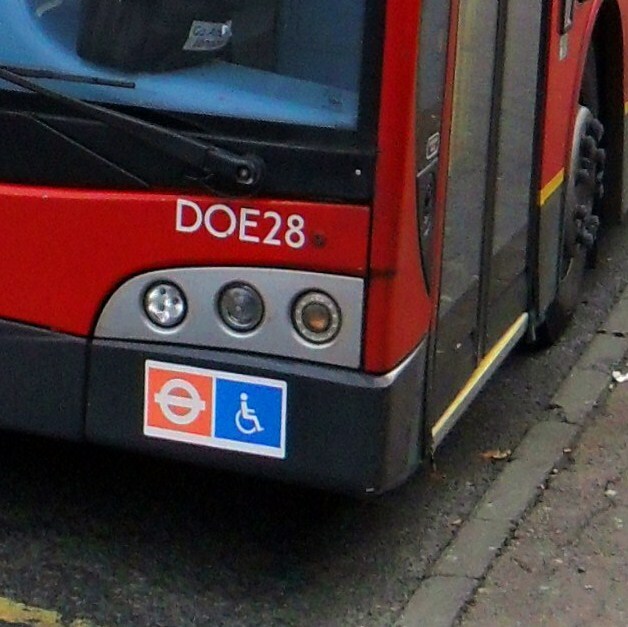 ‘DOE’ refers to bus type (both chassis and body design), ’28’ is the individual number assigned to that specific bus. The letter refers to the garage where the bus comes from. So, all 213s will have ‘A###’, where ‘A’ means Sutton. Previously, they could have had ‘K’ for Kingston or ‘NB’ for Norbiton Garages but they are both long gone now, Kingston where Oceana now is, Norbiton where the Wickes store is. The number following, the running number, indicates where the bus is in the fleet, so if you wait to see a few buses pass they should be in chronological sequence. This number corresponds to a duty number on the driver’s duty card, this tells the driver where on the route they are supposed to be at a certain time. These numbers appear on a red and grey panel fixed on the sign post. You can also get a full list of these on TfL’s website which allows people with fancy phones (what I call smart phones) to find out when the next bus will arrive at any given stop. 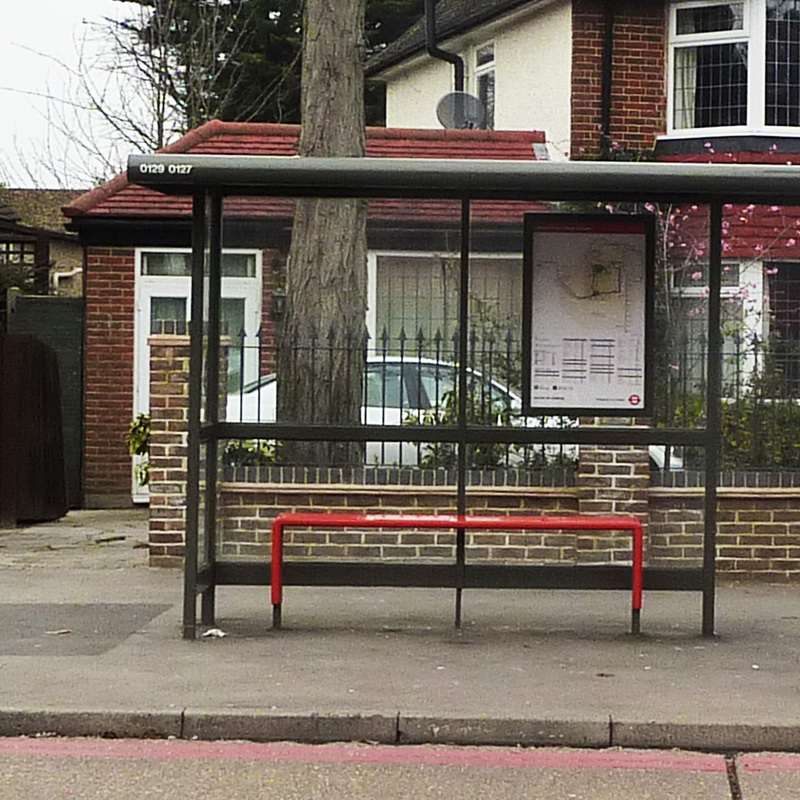 This is called a ‘Point Letter’ and refers to a position on a map which is used when there are a number of different bus stops to choose from, i.e. at interchanges and town centres. 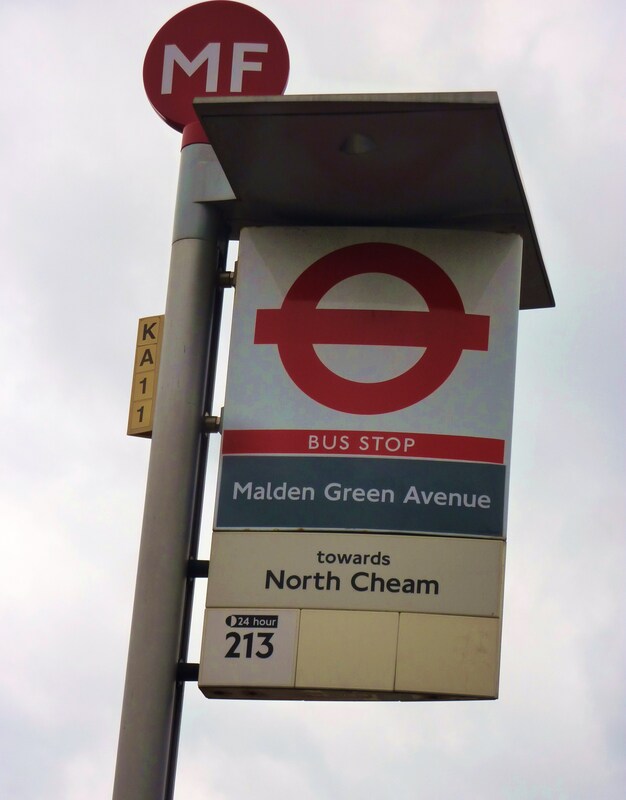 It is specific to a physical location so that for example, on the 213 route there are three stops with point letter E.
This is called the stop number and is unique to the sign, it is on a little greyish disk on the bottom of the route display, for London Bus’s inventory records. Individual shelter number and location map for identifying your stop.